Yuansheng Temple was built in 1930 (according to a plaque on the site) "to release the soul of the late salt merchant Xiao Yunpu from purgatory." There had previously been a guildhall on the site (if I understand the Chinglish of the plaque correctly). 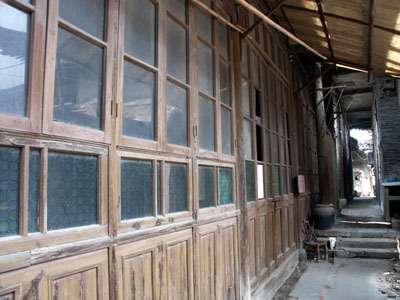 A hall on the north side (pictured below) still has three rooms made of "Nanmu wood" that date back to the Ming dynasty. 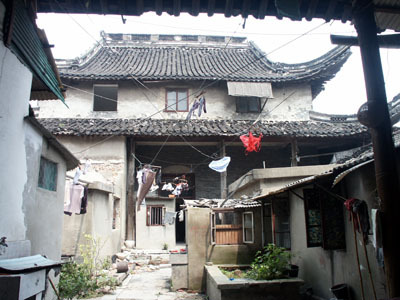 It was, the plaque says, "the biggest temple built in Yangzhou during the period of the Republic of China." 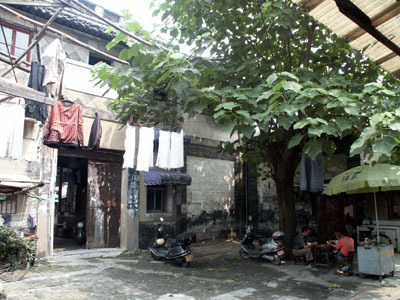 The first sight to greet the visitor is the laundry hanging in front of the "main gate." Scooters are parked everywhere willy-nilly, and some indolent fellows are playing cards under the umbrella on the right. Entering the gate, one encounters the "courtyard." More laundry (the red bra is an especially nice touch) and squatters' shanties fill the space. The "main hall" (straight ahead) is occupied and not accessible to visitors. This is the front of the "Ming Dynasty" building. It was in fact the only hint that this place might have been something at one time. This corridor is hanging feebly onto the other (south) side of the "main hall." I was afraid to mount the steps on the chance that they might not hold me. 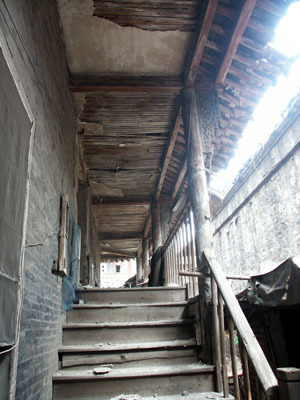 Visited on a ramble through the hutong (alleyways) in July of 2007.